(Source) Three years ago in Poland, independent of the local authorities and the established church (Polish Autocephalous Orthodox Church- PAPTS) website “Orthodox Partisan” – prawoslawnypartyzant.wordpress.com ,which houses alternative news and critical evaluation of religious life in Poland and the entire Orthodox world. In this short period, it became the most popular website in an Orthodox country with daily traffic to the site of up to 5000 visitors. The editorial site included people from various Orthodox jurisdictions, including local PAPTS people that did not agree with their policies and politics. One of the staff of this site, as it is known, is Reader Martin Miroslavovich Pekarskiy, who five years ago broke communion with the ecumenists and moved to the Greek Synod in Resistance. In general, the management of the site, for obvious reasons, is always anonymous and everyone who sent in their articles and letters of support do not wish to disclose the names, and are guaranteed anonymity. Online Polish language materials were published on Sergianism, the cooperation of local bishops with special services, as well as articles with harsh criticism of their participation in the ecumenical movement and manifestations of renovationism. The site has become popular not only in Poland, but also abroad, and his articles have been translated into Russian, Serbian, Greek and English. The local Orthodox population was keenly interested in materials, wishing to participate in discussions and express their opinions on issues of concern. Letters on the site included not only Orthodox, but Catholic traditionalists, who helped with the transfer of different materials free of charge. Quietly in participation of some on the site were even some priests of the PAPTS. On our website, there was also contact some professionals who used it to lead Classified Internet lessons on Church Slavonic language. Not surprisingly, of course, the site was subjected to constant attacks. But the biggest blow was dealt the site at the end of February, when a hacker working with its opponents managed to capture site and the mailbox. A few days before the e-mail version of the letter had been sent by a certain “priest of the Church Abroad-MP”, Fr Andrew Tsvetov from Berlin, who allegedly broke communion with Patriarch Kirill of Moscow Patriarchate and for some reason is looking for opportunities to contact with anti-ecumenists in Poland. It was all too obvious that this is was provocation, as he began to ask questions to find out what the Church owns the site, how many people “in the parish,” claimed that he, too, had a site of the “wordpress, but it was deleted,” offered its contributions . He received no reliable data, of course, because with they were fictional characters talking to a fictional character. Details can be found here, as authors of this provocation created a space on facebook titled “Anti Partisan” and right after it was announced on the correspondence that it was “founded by the “chief editor” of Orthodox Partizan “. It was then announced that it is necessary to seize the site and remove the disadvantageous texts. What happened a few hours. Once they succeeded, the Facebook page was been removed. At the same time e-mail messages were sent to the site as though to the administration of Mail.ru: of course, the letters were unbelieveable. But the hackers constantly improved the quality and accuracy of their provocation. In another letter was sent a link by clicking on the opened pages that appeared identical to at the entrance to the login (in this case it was necessary to reset the password). In this way, they managed to grab the mailbox, and then the box associated with this site “Orthodox Partizan”. (NFTU: This method is known as “spoofing”.) The new owner immediately declared the capture of the site, changed the look of the site and began to remove the articles of Sergianism, ecumenism, Freemasonry, and Renovationism among the Polish Church (PAPTS) Bishops. Administration site still managed briefly to capture the mailbox and delete all folders with letters. Invading the site not being enough, they had to find a website editor. They managed to establish a personal “mailing address” as “Reader Martin” (purporting to be one of the main authors of the site). The hacker was deleted user named “maptys” . All the same person who wrote the site mail, were sent to their mailboxes trap letters, with strange (some would say, mocking) statements. Example: Andrew B. (email deleted for security- NFTU): Hi, I received your email from Paul. Despite the setbacks, do not give up. You’re driving the right thing, we can say the apostolic mission. A lot of people behind you, even some of our clergy and monks. We pray for you. We hope that your work is not lost. The truth always wins, even if it is unpleasant. I am very interested in holding your website: I hope that some slaves of agent “Eureka” will not interfere in your work. We pray for you, Andrew and friends. I send you a very interesting video about the Russian saints, I hope that he will strengthen you spiritually. (link deleted from the original-NFTU) PS. I know that you support some candidates for the Polish episcopate of the Church. Congratulations and all the best. Clicking on this link opens a fake login page to mail Gmail. And in this way a hacker gains access to an unsuspecting man. It is not known how many people are working with the website, got the message trap. On the captured site hacker(s) declared that a photo was found one of the employees – Reader Martin (he, in fact, has never hidden). In this case, a photo was added, that’s below the article. 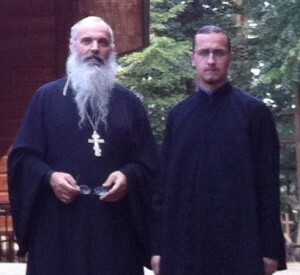 One of the priests of the city of Bialystok, Yan Koylo said on facebook (http://www.facebook.com/groups/prawoslawni/) , claimed they will remove all dissenters with the Polish Church with websites, adding that to such dissent it’s necessary to “beat their heads,” and if someone disagrees with something in the Polish Church – “Get out!”. I personally suggest to everyone running True Orthodox news sites that they archive or backup their sites (usually this is done with .xml files) on a regular basis, because no matter how good your security is, someone CAN get through– few sites are bulletproof and depending on how much Sergianists and Ecumenists want to invest on destroying your work, most regular sites can be compromised more easily than people assume. The best thing to do is to make regular backups and share it internally with your editors. This way in case of hacking (or death or apostasy of any one member) the archive can be replaced in a corresponding format (WordPress and Blogger allow easy archive exporting and importing) by the other editors in a worst-case scenario. The above story is an object lesson in why when you work in True Orthodox news exposing falsehood, you have to trust– but verify. I pray the editors of “Orthodox Partisan” get their site back intact. Visiting the site however, it appears to have been, after abuse by hackers and public controversy, deleted.